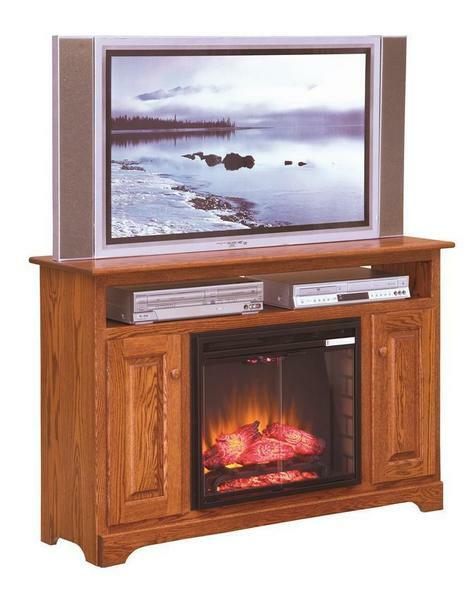 Our Amish Islington 55" Electric Fireplace TV Stand will take your entertainment time to the next level. Handcrafted in Lancaster County, Pennsylvania, this piece is held to the highest standards before it enters your home. You will not be disappointed in the superb craftsmanship that will be as evident when you first enjoy it to many years down the line. Gathering with family and loved ones before a warm fire to watch your favorite movie is the kind of event that memories are made of. Enjoy the warmth and style of the Islington Electric Fireplace without having to worry about any clean up. The remote control unit allows you to adjust the heat setting from the comfort of the couch. Select heat and flame display, heat only or flame display only. Halogen bulbs are used for the flames and light in your Amish made electric fireplace. These units are portable, just plug them in and enjoy the display. Take a look at our collection of Amish Fireplaces to see all we have to offer. Pass this piece down through the generations thanks to its exceptional construction. Order yours in one of 6 varieties of 100% hardwood. No matter what you choose, you can be sure that the utmost attention to detail will be built right into your unique piece. Please feel free to call us with questions regarding this American-made TV Stand: 866-272-6773. All fireplaces are made so the flames can be on without producing heat.